Shark Diving Indonesia very concerns on limited academic researcher on chondrichtyan fishes, both in quantity or quality. Therefore Shark Diving Indonesia starts to share some of its profits and investment on funding the Indonesian University Student especially in Marine Sciences Degree to conduct shark research in Morotai as part of their final assignment. Shark Diving Indonesia would likely also seek a joint-research with LIPI (Indonesian Institute of Sciences) to conduct shark behavior joint-research in 2014. Short term research program initiated by Shark Diving Indonesia is visual observation or shark census on its population and abundance in four selected location: Tanjung Dahegila Timur, Tanjung Dahegila Barat, Terminal Gurango and Grey Shark Point. This research is aimed to established solid baseline data for further research that consists: Shark’s Behavior, Shark Fidelity, Correlation between Sharks and their habitat, etc. Midterm research program will be focused on visual observation of Shark’s Behavior, Shark Fidelity, Correlation between Sharks and their habitat, etc. 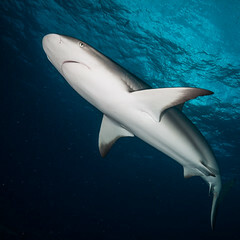 This normally consists of one-year period of visual observation on the typical species of shark (e.g. grey shark) in such specific area. Long term research program is aimed to use more current technology to support the research such as radio-telemetry, microsatellite sequence-tagging, etc. on shark’s life.